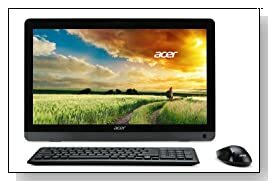 Acer Aspire AZC-606-UR24 is an economical All-in-One desktop PC with a beautiful design and budget price to help you perform your day-to-day things efficiently with its Celeron J1900 quad core processor, good amounts of memory and hard drive, a 19.5 inch Widescreen display and Dolby Audio. It is ideal for both home entertainment and student use because of its performance levels despite its attractive price tag. Aspire ZC has the Intel Celeron J1900 quad-core processor (2MB Cache) at 2.0 GHz speed (up to 2.42GHz with the Intel Burst), 4 GB DDR3 RAM memory for multitasking, 500 GB SATA HDD at 5400 rpm rotating speeds as good amount of storage space and the Windows 8.1 operating system with its familiar Start screen. You can access your important files- music, photos, videos etc. wherever there is internet connection and on any device with the AcerCloud. Celeron J1900 offers good performance levels (much faster than the previous Intel Atoms) and great energy efficiency for entry level desktops. It is quite adequate for web browsing, Microsoft Word and Excel, streaming videos, playing music or light games but not really for the very complex multimedia or the latest games. 19.5 inch HD+ LED Back-lit Widescreen display with 16:9 cinematic aspect ratio, 1600 x 900 pixel screen resolution and Intel HD Graphics (Bay Trail) offers decent visuals- it is nice to have the HD+ 1600x900 resolution rather than the 1366x768 pixels that is more common at this price level. 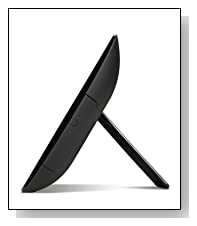 The ergonomic screen tilts from 10 to 30 degrees conveniently to give you comfy viewing. For decent smooth sound quality, it has the optimised Dolby Audio surround sound, HD Audio support and two integrated 2.5 watt per channel hi-fi stereo speakers. The webcam is HD quality and has a built-in microphone for clear chats on Skype. Elegant black Acer Aspire weighs a bit under 11 pounds and has the dimensions of 18.90 x 2.13 x 12.32 inches so it is a little thick as an All-in-One but lightweight and I don’t see why anyone would complain about the design at this low price. You have the 802.11b/g/n wireless, Bluetooth 4.0 to connect to other Bluetooth enabled devices wirelessly, 10/100/1000 Gigabit Ethernet with RJ-45 for wired internet, 8X DVD SuperMulti Double-Layer Optical Drive on the side, 3 x USB 2.0 ports, 1 x USB 3.0 port for fast data transfers, Digital Media Card Reader, great looking and comfy USB Keyboard and Mouse and the built-in HD Webcam. Conclusion: Acer Aspire AZC-606-UR24 is a great budget level AIO desktop PC with the convenience of having everything in one place behind the screen, while not sacrificing performance. But we’re talking about the performance levels for what it is designed to do- the lighter daily tasks and not so much the heavier or very demanding multimedia or 3D games. Ports are conveniently located on the side and front so that you can access them easily and it sure is nice to have a clutter-free desk. RAM and HDD are what you would expect at this level- both adequate and the Celeron J1900 processor that was released at the beginning of 2013 is an entry level one but definitely faster than its predecessors, while the 1600x900 pixel resolution HD+ screen and the Dolby sound system are good for entertainment. Sure this Acer Aspire is not perfect and has its flaws, but you have to look at it from its price range perspective- it gives you more than what you pay for and well recommended if you’re on a budget.